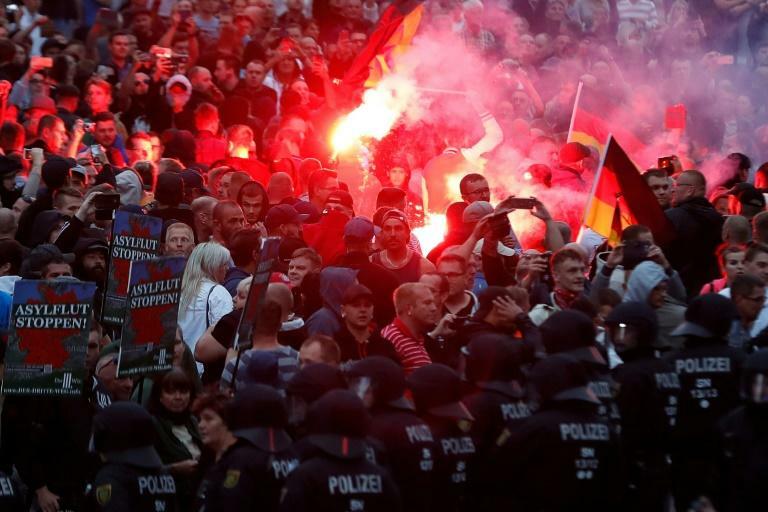 German far-right demonstrators gathered in the eastern city of Chemnitz to protest Chancellor Angela Merkel's immigration policy Thursday, but there was no new outburst of the violence that followed a weekend knife killing. "When we see everything asylum seekers get compared with old people, poor young people, Germans, it's not surprising that people explode," said Tobias, a local man in his 50s who asked not to be named in full. The two are suspected of stabbing 35-year-old carpenter Daniel H. to death after what police called an "altercation" in which three other men were wounded less seriously. 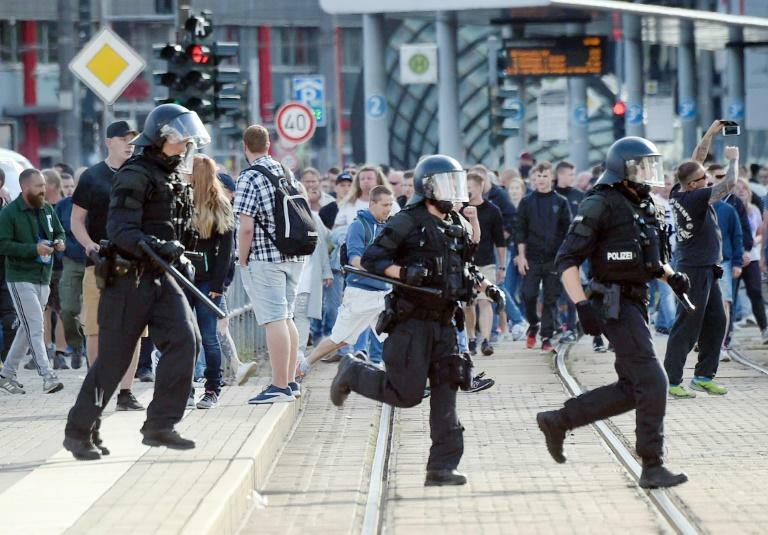 After being heavily outnumbered by thousands of neo-Nazis, football hooligans and other extremists, police called in reinforcements from other states and federal police Thursday. "We won't tolerate hooligans and violent far-right criminals taking over the streets," said regional interior minister Roland Woller. In another violent hate crime overnight Wednesday in the ex-communist east, a 20-year-old migrant was subjected to xenophobic insults, and kicked and beaten with an iron chain by three men in the Baltic coast city of Wismar, police said without giving his nationality. Images of the Chemnitz violence went around the world, but demonstrators gathered under a banner reading "the people are rising up" chanted "lying press!" as a speaker denounced the TV footage. The sight of protesters making the illegal Nazi salute in front of police officers was "shocking," said UN human rights chief Zeid Ra'ad Al Hussein. Meanwhile Christoph Heubner, executive vice-president of the International Auschwitz Committee said that "Holocaust survivors are watching the attempt by far-right groups to seize power over the streets and bring hate into cities with growing concern." Tensions risked being inflamed further by a news report that the Iraqi suspect in the murder case, named as Ibrahim A. aged 22, had avoided deportation despite a lengthy criminal record. Since arriving in 2015 he had reportedly received a suspended seven-months jail term for assault and been charged with other offences, including taking illegal drugs across national borders, fraud and property damage, Bild reported. Crimes by immigrants are routinely seized upon by far-right party Alternative for Germany (AfD) and street movement Patriotic Europeans Against the Islamisation of the Occident (PEGIDA) who label Merkel a "traitor" for allowing them into the country. Anti-immigration groups plan a "silent march" Saturday for the stabbing victim in Chemnitz, an AfD party stronghold.